Pittsburgh Steelers Head Coach Mike Tomlin has used the phrase for some time now that "We made our bed and we have to lay in it". This statement is ringing truer and truer as the days go by and the saga with Antonio Brown continues. 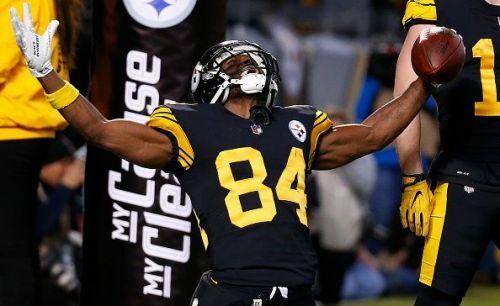 The Steelers disgruntled wide receiver has been at the center of drama for years now. It used to be sideline, childlike tantrums with coaches and coordinators. However, it has reached a boiling point and gone far beyond that in the past year or so. Brown has still been throwing his childish tantrums on the sidelines, footballs at Ben Roethlisberger in practice, and even furniture off of a high rise balcony in Miami, Florida. Now some may say "so what?" when it comes to throwing furniture. But when a toddler below is endangered because of it, a civil suit that comes of the incident surely does not look good. Neither does "AB" receiving a speeding ticket in Pittsburgh and blowing off the court date. It also does not sound good when you hear of him allegedly shoving the mother of one of his children to the ground over a dispute over paying for a haircut. Yes, a multi-millionaire is apparently above paying for their kid's own haircut. So much so that it angered him to the point where he felt the need to shove this kids mother to the ground. Brown has had the nicknames "Tony Toe Tap" as well as "AB". His newest nickname, "Big Chest Brown", really sheds the light on how much of a maniacal, egotistical, narcissist Brown truly is. But the problem is that it has not stopped there. On Thursday night, Brown apparently was in the center of a trade in which he would go to the Buffalo Bills. According to multiple reports, however, Brown said he would not show up in Buffalo. Perhaps Mr. Big Chest is afraid that Josh Allen at Quarterback would be a far worse option than his current two-time Super Bowl Champion and future Hall of Famer Ben Roethlisberger. I surely think so. But this is the same guy that just threw that Quarterback under the bus in recent months by continuing the spewing of his mouth. Now I am not going to suggest the Steelers totally allowed for all of this to happen with Brown. It is not their job to control a 30-year-old man playing professional football and keep his head on straight. At some point or another, AB needs to grow up. But that is not to suggest that the Steelers did not enable him to some degree. This guy has shot Facebook live videos in a locker room after a playoff game when his coach was discussing a win on the road. If said coach would have made derogatory comments towards the next week's opponent, that instantly provides bulletin board material. At this point, I think Brown is beyond a fixable point. The ego, due in large part to the money and fame he has made for his name and his brand, is too large to control. Perhaps another franchise can instill a culture that allows him to be himself but stay out of trouble and cut the antics out. It surely does not seem like Mike Tomlin and the Steelers have provided that culture. They have made their bed with this guy and enabled this activity for too long. Now they have to lay in that bed. I have been laughed at in the past for suggesting that the Steelers having Brown in their locker room is not what is best for business. Those people that laughed have been awfully quiet as of late. Antonio Brown is a great player and an all-time great at that. A case can be made for Brown as his generations best wide receiver. But mark my words when I say that the Steelers cannot and will not win a Super Bowl title as long as Brown remains in Pittsburgh. Unfortunately for the Steelers, they enabled this type of childish behavior for too long. Now it has spiraled out of control. It's at a point where there is no fixing his attitude or behavior. That would not be an issue if they were able to move Brown at first attempt. But if reports that stated he said he would not report to play in Buffalo are true, they may be stuck with the guy. But this is their bed, they made it with AB and they have to lay in it. Are The Cabell Midland Knights a contender for the AAA title along with RB Ivan Vaughn being a potential Kennedy Award Winner?